Meet Jane. Jane is the CEO of Jane’s Addictive Sweets. She makes cupcakes. You like cupcakes, and you want to work for her. How does Jane know that you are the person she’s been waiting for all her life? Skills are your character traits and the abilities you learn that make you a good employee. They build your professional know-how and help you perform your job responsibilities well. You can have soft skills such as interpersonal skills or teamwork skills, and hard skills such as technical skills, etc. A list of skills to put on a resume is as important as icing on a cupcake. No one wants a cupcake without icing. No one. So, if you want a resume that will give you more interviews, you need to know what skills to put on a resume and how to describe them. Where to put work skills on a resume. What skills to put on a resume to get you MORE interviews. How to list work-related skills on a resume. 31 best examples of how to put your skills on a CV (right vs. wrong examples). INFOGRAPHIC that shows the most important resume skills. Apart from experience and education, you should consider putting your achievements, a resume summary, and key skills on your resume to make it stand out. This article will show you how to put key skills on your resume. Here's an example of the wrong and the right way to put skills on a resume. Want to save time and have your resume ready in 5 minutes? Try our resume builder. It’s fast and easy to use. Plus, you'll get tips while writing your resume. See 20+ templates and create your resume here. 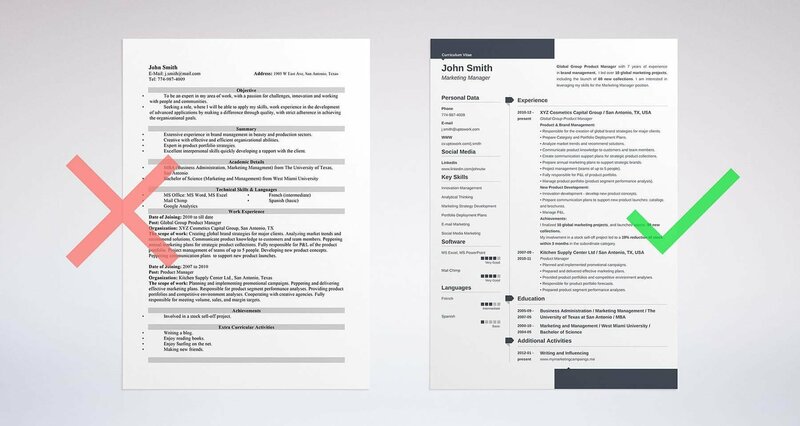 Sample resume template — See 20 other templates and create your resume here. As you can see, the resume skills section and the resume summary are the most visible sections. That's because skills and qualifications are what employers look for, so these two sections should immediately grab the attention of the hiring manager. What are key skills for your resume? Key skills are work-related skills that you need to do a job. Most often, you can find key skills in job descriptions. Where do you put skills on a resume? Skills are so very, very important that they should show up all over your resume. Not just in the resume skills section. You do need a professional skills section, and it should be in a prominent place on a resume. You can also try putting your skills section in a side column. A skill set (also spelled skillset) is the job candidate's range of abilities, experience and knowledge essential to perform a particular job in a professional way. It is a combination of things the job applicant is good at and which are useful for a given position, e.g. leadership, research and planning, management, accounting, etc. A good list of the most desired skills will make your resume better than 9 out of 10 others. Check out these proven job-winning skillsets recruiters seek in 2019. Get our handy FREE EBOOK: Six Desirable Skill Sets That Will Get You Any Job You Want. Also, make sure that a couple of your key skills appear in your professional resume summary and cover letter. Several should show up in your work history section. Sprinkle a couple through your education section as well. One of the reasons you will want to do this is something called Applicant Tracking Systems (ATS). More about that later. First, you need work-related skills. Not bow hunting skills or nunchuck skills. Real career skills. So, what are those skills? Skill is an ability or a talent that lets you get things done. And getting things done is what matters to employers. There are two different types of skill sets: hard skills and soft skills. Hard skills are not “skills that are hard to learn.” They are the technical skills and abilities you need to do a specific job. For example, say you are applying for the position of dump truck driver. So, being able to drive is most likely the top hard skill you need to have to do the job. Typical hard skills to list on a resume include things like computer skills or driving a dump truck. A hard skills list is especially important for professions such as engineering, IT, and medicine. They are special skills like communication skills, relationship building, management skills, and creativity. They are often harder to demonstrate, learn, and define than technical skills for a job. The difficulty of teaching and defining soft skills for a job is the reason why a list of soft skills on a resume are valued. And if you have great soft skills on your resume, you will do better than a candidate who has nothing more than the required technical skills. For example, research by the National Association of Colleges and Employers (NACE) shows that the key resume skills employers favor in new college graduate applicants aren’t the technical types of skills for a resume. So, what skills are the best to put on a resume? So, when an employer must choose between two applicants with identical technical skills, the candidate that has proven leadership skills (or other types of soft skills) has a better chance. Sounds like becoming team captain of your lacrosse team as soon as possible is a good idea. Still not sure what skills to put on your resume? 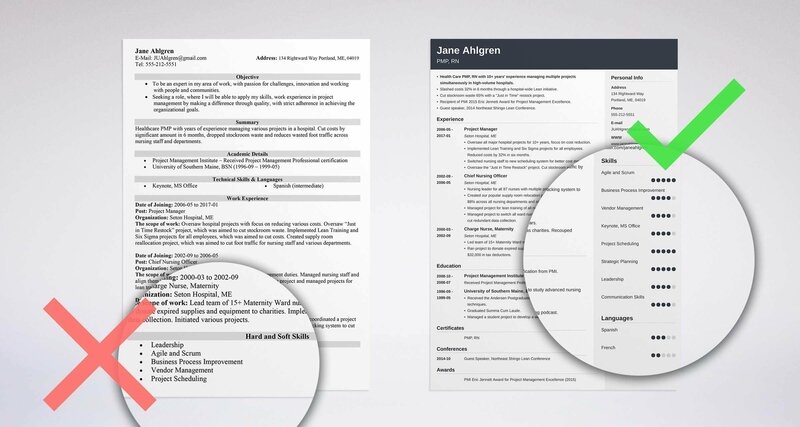 Take a look at our list of sample resume guides for 150+ specific professions. First, you need to choose the best skills for your resume. This is the most daunting part of adding a resume skills section. I know how to use a computer. It’s a good hard skill. So I add “computer skills” to the bullet point list at the end of the resume. That’s great. Got it. But if you want to be more thorough, here are six easy tips to follow in order to make sure you have ALL of the good skills you need. So how do you decide which skills to put on your resume? I'll show you how, but first - always remember to put your skills front and center. Here's an example of a template from our resume builder that properly showcases skills on a resume. What skills are relevant for a resume? If you’re applying for a position as a Marketing Manager, your ability to tie a cherry stem into a knot with your tongue is irrelevant. Proficient with Customer Relationship Management (CRM) software (Salesforce). Tying cherry stems into knots. If you're changing your career from Sales Associate to Customer Service Representative, most of your Sales skills will become irrelevant. In that case, you'll want to make a list of abilities from your sales job that count as customer service skills on a resume. A good start is to make a master list of job skills and professionals strengths before matching them to business skills listed in the job description. Take a moment to think about all of the awesome things you can do. Make sure most of them are things to put on a resume. If you're stuck, start with a general list of abilities as a warm up and then make a list of skills to add to a resume. Which of these things could be your hard skills? Can you prove them? Which of these could be your soft skills? Again, can you prove them? Are you a good listener? That’s a great soft skill. Can you use Microsoft Word? That’s a very basic hard skill. Maybe you have some of these key skills. Maybe your skill set is completely different. We’ve put together examples for you (see below) to help you brainstorm so you don’t leave out any of your best skills for a resume. Next, match your list to the resume skills listed in the job description. Why is this important? Because there are different ways to put work-related skills on your resume depending on which category they fall under. Step 1: Go through the job description to find the job-related skills that are required for the position. Step 2: You should have most of these key skills. Otherwise, you won’t be able to do the job. Speak in front of large groups. Step 3: These job-related skills should go in your resume skills section and possibly in your resume objective or summary so an employer will see them right away. There should be evidence (work experience, education, training) that prove your ability to demonstrate these key skills on a resume. Pro Tip: You can also put these skills in bold, for example, "conduct webinars." Using bold for resume keywords helps the draw the recruiter's eye while they are scanning, and will make you more memorable as well. Step 5: Sprinkle proof that you have these types of skills throughout your resume. Add a few with quantifiable proof to your professional skills list. If you want to get more interviews, tailor your resume to the job description. Here's how: "6 Proven Tips On How To Tailor Your Resume To The Job Description"
Once you’ve mined the job description for examples of professional skills to include on your resume, visit LinkedIn for a little bit of snooping. Why do you want to peep on other professionals? Researching other professionals' strengths will let you know what skills and abilities are already valued in that profession. Add any duplicates of your skills to your resume skills section. Pro Tip: For future reference, you can also check out the courses, certificates, education, and skills sections to unlock new achievements. Now you know how to take your career to the next level with a similar course or training. Remember that employers will also check out your LinkedIn profile. Here's how to optimize it: "99 LinkedIn Profile Tips: Background Photo, Headline, Summary & More"
Are any of your transferable skills and qualifications missing? Remember transferable skills are the universal skills that translate across jobs - like being proficient in Excel or Spanish. Good skills like Excel and Spanish are always relevant. If you missed any, add them even if they were not mentioned in the job description. Feel like your skills are weak? Adding hobbies and interests can beef up your skill set. Here's how: "Best Examples Of Hobbies & Interests To Put On A Resume (5 Tips)"
Go back and check one more time to make sure you have EVERYTHING. Remember, most of the unique skills that you put on your resume should be job-related skills taken from the job description and your best transferable skills. Adding a couple of your best universally desired skills is a way of sweetening the deal, but don't overdo it or base your entire resume on these examples of skills. Have a look at our resume skills list. Do you have any of them? Bonus: Download our list of the most desired career skills and examples of how to add them to your resume. "Examples of How to Put The Best Skills on Your Resume." Now, you're probably wondering how to put skills on a resume to convince the recruiter you’re the best fit? Use facts and figures. Forget about superfluous adjectives. It’s as simple as that. Able to raise sales conversions by 45%. Proficient at sales conversions. MS Excel - advanced (macros, pivot tables). Has a great command of MS Excel. Use proof to persuade to draw recruiter’s attention. If you need more examples of achievements for a resume and tips read our guide: "Examples of Professional Achievements To Put On Your Resume [3 Proven Tips]"
Today, a lot of resumes are read by robots before they ever fall into human hands. That’s right. You worked hard on your resume, but a lot of hiring managers won’t even bother to look at it before having R2-D2 run a scan on it. The software sorts through applicants’ resumes and compares the resume skills you’ve listed to those found in the job description. To pass the inspection, you have to match a certain amount of these resume keywords. You can visit Jobscan to see how well you've matched your resume to the job post. Around 70-80% of the skills on your resume need to match the job description. Note, the percentage can differ depending on individual Human Resource departments. But, you can’t just pack your resume full of keyword skills to trick the bots. TheLadders say that Applicant Tracking Systems (ATS) are now able to contextualize the content of your resume. The software can read your resume almost like a human. That doesn’t mean that keywords aren’t important. Keyword skills should appear throughout your resume. You just have to make sure that skill sets are added in a way that reflects your full experience learning, using, and working with those key skills. Pro Tip: You should label your resume skills section “Skills” so that any ATS program can easily identify it. Want more tips? Read our complete guide: "42 Amazing Resume Tips That You Can Use In 30 Minutes [Examples]"
The shift to a technology-based economy has made science, engineering, math, and IT skills some of the most in-demand skills for a resume among employers. So, what are the best technical skills for a resume? Other (more relatable) hard skills like driving are still important due to the growth in professions requiring such employability skills. You don't have to be a PhD to be employable. You simply need to put the right skills on you job application when replying to a specific job posting. Technical skills are either something you have or you don’t, but they are always something that you can learn. Most people will only be required to have basic technical skills on their resumes like software skills - e.g., the ability to use Microsoft Office and Excel. Still unsure about what to put on a resume? Read our guide: "What To Put On A Resume To Make It Perfect [Tips & Examples]"
And after you’ve proven that, the fact that you have listed universally desirable skills on your resume will put you ahead of the pack. Carefully craft a good skills section for your resume. Place key skills throughout your resume. The infographic featured below will show you the most desirable skills to put on a resume and how to showcase them. Still not sure what skills to list in your job application or how to do it? Reach out to us in the comments and we'll help!